Adding a deck to your home increases its value and adds outdoor living space. Choosing a shape, the size and furnishings, such as benches and planter boxes can be difficult. Designing a deck online takes the guesswork about what your deck will look like after it's completed. Many online tools have 3-D options, and some will print a list of materials you'll need to build the deck. Most garden design programs have a deck option. All of the programs listed here are intuitive and easy to use. Use Deck Designer for free. The tool lets you choose the shape and size of your deck. 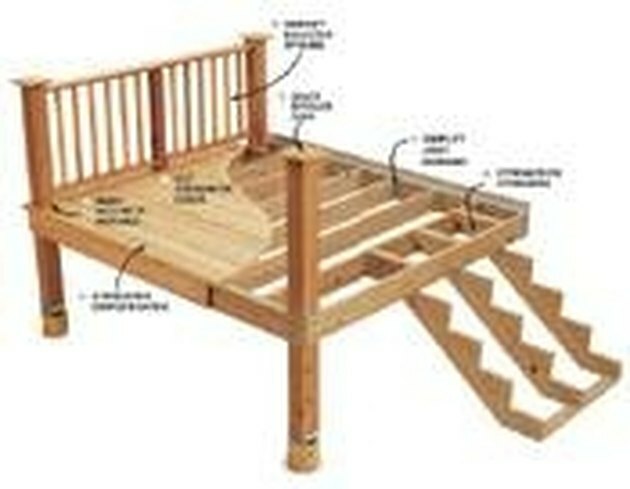 You can add railings and stairs and design multilevel decks. When you're finished you'll have a printable 3-D model, a list of materials, tips and guidelines. Download Google Sketchup for free and use it to design any object in 3-D. The program is reasonably easy to use, and there are extensive help files and videos if you get stuck. Sketchup allows you create objects for your deck design that are nonstandard and not found in more structured programs. Register to use Better Homes and Gardens' Plan-a-Garden. The design tool has a deck option. You can place your deck in your yard or garden design and resize it. The tool is not as sophisticated as others, but it is useful if you're also planning a garden. Add a deck to a garden design with Virtual Garden. The program is designed for landscaping, but it does have a deck option. You can place the deck in the yard and view it in 3-D. The program is free.